Yellowstone National Park is, in my opinion, the most unique park within the USA. Want more US Destinations? Check out Washington, Oregon and California here! There is nothing quite like it, and that is proven by the fact that over 4 million people visit each year. Like with all parks, there are amazing sights along with some not so great inconveniences. One thing cannot be disputed though: the good outweighs the bad in this wild part of America, and the trip to this park is worth it whether you can only spend a day, or you explore the park for multiple weeks. Located leading into the NorthEast entrance to the park, this stretch of winding road at almost 11,000 feet is a must-see. While not officially part of the park, it is just as wild. There is snow in the Summer, there are very vocal marmots, serene lakes, and not too many cars. You are driving close to the tops of peaks in an area where you can have a snowball fight in July, making for a very unique drive. The most wildlife I have ever seen has been within Yellowstone. On my first trip I was treated to a baby bear in the trees, a sleeping grizzly bear (way off in the distance, thankfully! ), and prancing elk. The highlight of this trip was leaving the park at dusk and being surrounded by a passing herd of bison. I have never felt so at the mercy of animals before, as they were larger than our small little Mazda, and there were many of them. I have also gotten up close and personal (while respecting the recommended distance) with bison crossing the road and standing alongside it. It is especially fun to see them rolling in the dirt to stay cool, or spotting little calves. The Yellowstone herd is the only herd in the USA that has lived since prehistoric times, so it’s quite a special sight to see them. I could write an entire post just on the thermal features in the park, there are that many. From bubbling mud pools to geysers, and from travertine terraces to hot springs, there is no lack of new and exciting things to see in the park. This is truly what makes the park so unique. There are a handful of places around the world in which you can see geothermal activity, the most popular being Yellowstone, Iceland and North Island New Zealand. 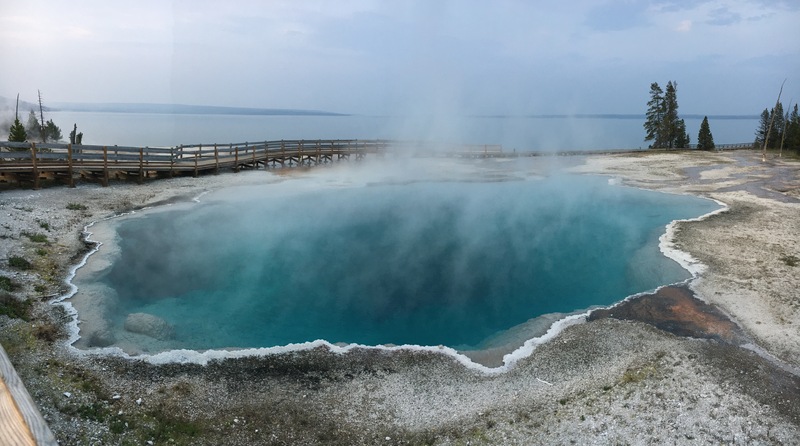 Some of my favorites in the park include: West Thumb Geyser Basin, a string of geysers which overlook Yellowstone Lake, Grand Prismatic Spring, Mammoth Springs and Old Faithful. Although the park is over 2 million acres, there are only so many roads. You can almost guarantee that driving through the park will be a slow adventure, and it is only projected to get worse. Bison are everywhere in the park! Since my first visit in 2015, the crowds have gotten much worse. During my most recent trip this Summer we lost over an hour and a half of daylight because of bison crossing back and forth. Although that would be expected to cause some delay, the sheer amount of cars that needed to pass meant that the backup went for an unimaginable amount of miles. My advice? Hike as much as you can through the park. The areas around geothermal features and boardwalks tend to be busiest, and there is so much more of the park to see! The fact that Yellowstone is closed during the harsh Winters is one of the factors that leads to such a concentration of people in the Summer months, and it also means that many guests cannot enjoy what Winter in Yellowstone has to offer. One entrance remains open, along with one road, which starts at the North entrance. Other entrances remain accessible by snowmobile, which is a cool option if you want to experience a different season in the park. My advice? Go in the Spring or the Fall. Although you cannot predict with certainty when the park will open or close, going as close to these dates will allow you to experience a side of the park that many guests do not get to see! One experience that may skew your view of Yellowstone (literally!) is the wildfires that happen around the park during the Summer months. Last year, the smoke was bad enough that the sky was hazy and visibility was reduced. While this is an inconvenience to park visitors, it can also pose a huge safety risk if fires begin within the park. It seems as though more and more wildfires happen each year, so the problem may just get worse. The only upside to this issue is that the hazy sky can make for some pretty beautiful sunsets! My advice? Check current fires before you visit the park, especially if you are visiting in August (when the climate has significantly dried). This is a website I have used before visiting the park, which offers helpful information in the form of a map you can zoom in and out of. No matter the inconveniences, Yellowstone National Park must-sees are greater. Each time I have had a different experience, and each time something new takes my breath away. ← A Truthful Traveling Baby! I like that you wrote about the good and the bad while still emphasizing on the beauty that is Yellowstone! Your photos are lovely! Thanks so much! I love writing the good and the bad because I know that all trips come with good and bad aspects! I hope you get to visit it, it truly is one of a kind! First off, your pictures are great! Secondly, I have to get to Yellowstone Park. Honestly, during the time I would be able to go (summer) it is just so expensive and crowded. I guess I’ll just have to find a way to go during the spring or fall instead. Thanks for the great post and giving something to ponder for the day. LOL! Thank you so much! If you can find time to go during the Spring or the Fall you will definitely experience less frustrations! Either way, the park is beautiful! I truly think this is one of the most beautiful of all our National Parks! Your photos are spectacular. Great info, will definitely save this for our next visit. It is in my opinion! Thanks so much, I hope this info is useful to you on your next trip! Such a huge park and sounds so adventurous destination. You nicely captured every photo. So lovely water color, is it always the same? The water color of each pool stays pretty consistent, but the pools are all different colors. Also, the bacteria mats that live around the pools change color, and can be anything from green to vibrant orange!!!! Wow you really captured some beautiful views! I have never been to this one, I want to so bad! Been to Yosemite and some others…I need to go here, thank s for sharing! Thank you! I have been to Yosemite, it is another one of my favorites! That’s an amazing comment! I hope you get to visit soon! Yellowstone National Park was on on my mind in my next visit to US. I have been to Smoky mountains before. After reading your article I guess, it will be in my itinerary. I have never been the Smoky Mountains, but I can definitely say that you will not regret a trip to Yellowstone! That’s such a compliment, I hope it is useful to you! I love this place! Looks like perfect for peaceful adventure!! It can be the place for a peaceful adventure if you know how to escape the crowds! I hope this comes in handy when you do get to visit, thanks so much! It looks so beautiful there! I am glad that you included both the good and not so good aspects of your visit, I hope to get there someday so I’m happy to have all this information! Thanks so much! I always like to include an honest picture of what a place looks like. I hope you get to visit, and that you love it!!! Ahh how amazing – I’ve always wanted to visit Yellowstone – hopefully some day soon! I hope you get there soon, it truly is an amazing place to see! I went to Yellowstone when I was ten, and I really want to go again. We’re thinking about taking the kids next year. It is super kid friendly I have heard! With the boardwalks around the geothermal areas you can take kids easily to the main sights! This is such an excellent overview of the park! Yellowstone has always struck me as too crowded to be enjoyable, but your description of the wildlife you saw and other features has me convinced to bump it up the priority list. Thanks so much!! It is crowded, but still worth the visit. There is nowhere else in the world in which you will see these sights all together in one place! Love this guide! The last time I went to Yellow Stone, I was like 10 years old and I’m itching to go back! Will definitely keep all your recommendations in mind. Thanks so much!! There is definitely tons to see, so make sure you prioritize your favorites before you go! Yellowstone National Park is high in my list of dream destinations. The wildlife and geothermal activity makes me so curious. I would definitely want to see them for myself. You would love it! There is always something new and exciting going on there- whether it is a new wildlife encounter or different colors in the geothermal pools! Yellowstone Park is so beautiful. It is a goal of mine to go there one day, maybe not during the not as busy months. It is super helpful to go when it is not so busy. My first trip I went mid June, and each time after that was in August. Because school is not out yet for everyone in June it is substantially less busy! Wow, love this post! I love Yellowstone- had a great time while I was there and hope to go back soon! I love it too! I would go back every year if I could, I don’t think one can tire of its beauty! I get what you mean about crowds in their cars. On the one hand it’s great that so many more people are enjoying the great outdoors in such an iconic destination but on the other hand, that kind of lessens the visiting experience. Your suggestion to go hiking is definitely the way to go where you can feel closer to nature and embrace all that is around you. It is such a hard topic- nature is now more and more accessible to people which is amazing, but places only have a certain capacity. I think hiking is amazing to escape the crowds almost anywhere! I’m actually from Jackson so these photos make me quite homesick (I live in LA now). Aw man, I do like exploring Yellowstone and totally think it’s a place everyone should see, however – go when it’s less packed! Ha! May be really hard for some to do but it’s worth it! I agree! I think its a totally different experience when you’re not stuck in a line of cars- that just reminds me that no matter how far out of civilization I feel I really am not. I like feeling like I’m one of a few around in a wild place! I have never been to Yellowstone, unfortunately, but would like to go someday. The scenery is just stunning and beautiful! You have good advice for going in the spring or fall, when there is a little less crowding. Thanks so much, it definitely makes a difference to go in the less crowded seasons! I love this! Yellowstone looks like such an interesting place to visit. It is the most unique place I’ve been in the world! Thanks for sharing all these amazing views. I need to visit. Thank you for reading!! You should, its an insanely beautiful place!